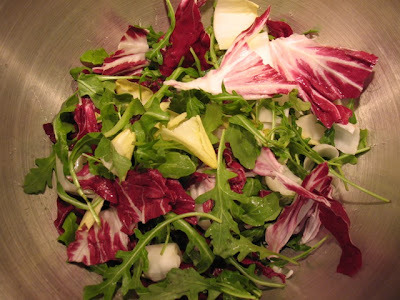 I combined then with arugula, which made for a rather colorful combination of leafy salad greens. I loved the toasted hazelnuts from the kale salad, so I brought them back, along with some smooth goat cheese and just enough onion to add a little zest. 1. Toast hazelnuts in a small (8-inch) pan over medium-low heat, tossing occasionally. When fragrant, remove from pan and wrap with a clean dish towel. After about a minute, rub the nuts through the towel to remove nuts' skins. Set nuts aside to cool. 2. Heat 2 tbsp olive oil in a medium (10-inch) stainless steel pan over medium heat. Pat chicken dry and add to pan when oil is hot (chicken should sizzle). Season with seasoned salt and fresh-ground black pepper to taste, cooking for about 10 minutes, turning halfway. Remove chicken from pan and set aside to cool. 3. Whisk together dressing ingredients. 4. 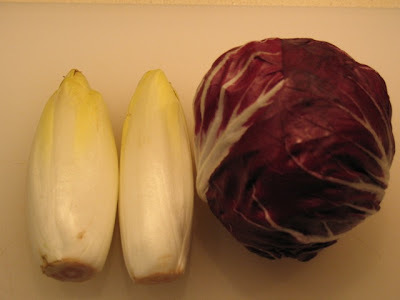 Separate and wash radicchio and endive leaves. Tear radicchio leaves and chop endive into bite-size pieces. 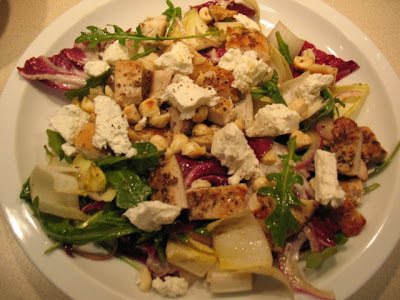 Combine in salad bowl with arugula, onion, chèvre, hazelnuts and chicken. Toss with dressing. Yum. You're on a roll with the salads. Thanks. This one was pretty good although I think I like the one with figs and goat cheese better. Oh wait, this did have goat cheese. I think I'm getting my salads mixed up. It's late and I'm tired. Okay, I'm just tired. Lovely recipe! I will certainly be trying it and i think i can successfully do it.! Thanks so much for a yummy recipe! Thanks! I hope you enjoy the salad. I'm on my diet, so salad is the only thing I can eat for dinner, I soon add this recipe to my meals, thanks for sharing.